Mareeba is well known as the ultimate destination for hot air ballooning in Australia. Situated just west of Cairns, on the fringe of the Australian Outback, its elevated position provides the perfect climate for an early morning balloon flight. The fleet of Hot Air Balloon Flights launch from a range of private properties spread over the Atherton Tablelands. The fertile plains and rolling hills of the Atherton Tablelands brings a mix of some amazing patterns and images when viewed from a hot air balloon above, you may even catch a glimpse of a kangaroo or two. 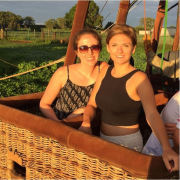 Sunrise provides the perfect conditions for hot air ballooning and makes for an incredible memorable experience. Watch as the balloons are inflated, then take to the skies in a 30 minute scenic balloon flight and enjoy the fun and excitement as you help to pack up the balloons at the end. 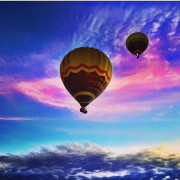 Hot Air Balloon Flights operate daily, all year round. 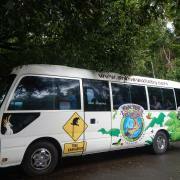 Paronella Park is situated on 5 Hectares of land beside Mena Creek Falls. Built in the 1930s by José Paronella, a Spanish immigrant, José dream was to create a pleasure garden and reception centre for the enjoyment of the public, which he achieved in 1935 when the park was opened to the public. Facilities included tennis courts, bridges, a tunnel, picnic areas, a cinema and a ballroom wrapped up in an amazing range of 7,500 tropical plants and trees that he hand planted. Inspired by Spanish castles, the remarkable architecture and incredible story is an asset in itself. Paronella Park today is a celebration of the Paronella family's achievements, particularly those of it's founder, José Paronella. This remarkable story now lives on...Paronella Park has received multiple Queensland tourism awards, is State and National Heritage listed and is a National Trust listed property. It is privately owned and operated and Eco accredited, and is the site of Queensland’s 1st privately owned hydro electric plant (1933). 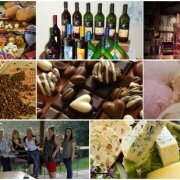 Fantastic photo opportunities, 5ha of tropical gardens, wildlife and fish feeding and a café with fresh local produce make it an enjoyable day out. Lake Barrine and Lake Eacham are crater lakes, formed from volcanoes. The lakes are approximately 65 metres deep and thought to be around 10,000 years. Lake Eacham has pristine blue water that is perfect for swimming and is surrounded by lush rainforest. Walking tracks through the rainforest provide secluded forest-fringed views of the lake and excellent opportunities for viewing wildlife. There is also a population of turtles that can usually be seen just to the left of the pontoon. Lake Barrine offers Rainforest Cruises and a Teahouse which has been operating since early 1927. Once you have enjoyed a traditional Devonshire Tea, take a relaxed 45 minute guided cruise around the lake and tour one of the most complex and beautiful rainforest eco-systems. Lake Barrine also features a rainforest walking track which is 6km. Swimming here is unsuitable due to the cruise boats. The small town of Yungaburra has a warm country charm, featuring craft galleries, cosy restaurants, cute buildings, and the popular monthly Yungaburra markets. The village has maintained its rich history and remains largely unchanged since 1910, with many original buildings still in use. A lovely little walk along Peterson Creek will take you to a platypus viewing area, you may even be lucky enough to spot a rare Lumholtz Tree-Kangaroo along the way. The Old Town Loop walk will take you back in time visiting many of the heritage listed buildings and give insight into the pioneers who settled there. The Curtain Fig Tree is another popular sight, located just 5 minutes from the centre of the village. This giant rainforest fig tree features a vast curtain of vines and roots which drop 15 metres to the ground, that give it the appearance of curtains. The Mamu Rainforest Canopy Walkway is a spectacular walk that allows visitors to explore the rainforest from the forest floor to the canopy, in comfort and safety. Located within Wooroonooran National Park, the Mamu Canopy Walkway features a 350 metre long elevated walkway through the canopy, a cantilever, a 37 metre observation tower and more than 1200 metres of walking tracks. The cantilever provides panoramic views over the North Johnston river gorge, the 37 metre observation tower emerges high above the canopy, offering sweeping views over a pristine rainforest-clad mountainous landscape, the walkway passes through one of the largest-remaining, continuous stands of complex vine forest on basalt soils in the Wet Tropics. 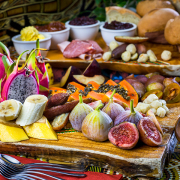 Enjoy close-up views of rainforest plants, insects and birds, and take in sweeping vistas of World Heritage rainforest landscapes, that is home to the Mamu Aboriginal people. Rest shelters present information of the rainforest's complex web of life and the rich culture and history of the area. 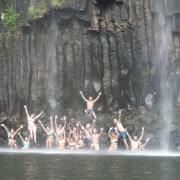 There is a positive to the wet season and that's the great diversity and magnificence of waterfalls we have to offer. The Atherton Tablelands is home to 17 of the nation's most spectacular waterfalls, starting with the Barron Falls in Kuranda. The Barron Falls is located within the Barron Gorge National Park and is 260 metres in total height. The Falls are at their most spectacular during the green (wet) season, December through to March. Davies Creek Falls is situated just beyond Kuranda, and features a magnificent waterfall cascading over huge granite boulders. 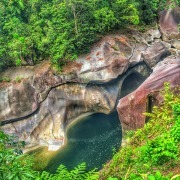 Further on is Emerald Creek Falls, located 3km from Mareeba. The falls plunge into placid pools, where you can take a swim and cool off in the refreshing waters. The picturesque Malanda Falls is located within the Malanda Falls Conservation Park and provides a popular swimming spot, as well as a site of important historical significance. The southern waterfalls circuit includes Millaa Millaa, Zillie and Ellinjaa Falls and further to the south Mungalli Falls. Millaa Millaa Falls is regarded as one of the most photographed waterfalls in all of Australia. The falls are framed by spectacular lush rainforest and tropical plants, which cascade perfectly into a pristine waterhole below. Mungalli Falls is the highest waterfall on the Tablelands, approximately 90m high, and features swimming holes above and below the falls. Chillagoe is located 140 kilometres west of Mareeba, and is a former mining town during the days of the 1870's to the 1920's mining boom. The town is a stunning mix of outback landscape, mining heritage, aboriginal art sites and fantastic limestone caves. The old township is still dominated by the Chillagoe smelters, which were built at the turn of the century by miners and speculators convinced the region was set to become the next Broken Hill. The rail link followed and the town grew to 10,000 inhabitants. 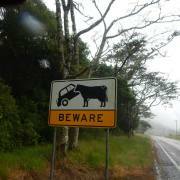 The region however failed to live up to its promise and millions were lost in the inevitable bust. The smelter staggered on until the 1940s when it was abandoned. 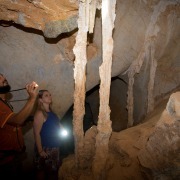 Just out of town is the Chillagoe-Mungana Caves National Park containing limestone caves. 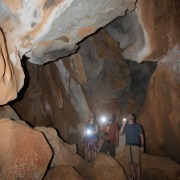 There are between 600 and 1,000 caves in the Chillagoe-Mungana area. The caves, the spectacular karst landscape and the mining and smelting history are the main tourist attractions to the region. Located on the eastern edge of the Gulf Savannah region, Undara Volcanic National Park is well known for its lava tubes and gem fossicking. The lava tube system is Australia's longest, and one of the longest in the world, originating from a single volcano. Undara Experience captures the essence of the real Australian Outback. Your stay at Undara Experience includes evening wildlife spotlighting walks, campfire evenings. From Undara Experience, you can visit the Undara Lava Tubes, and witness the unique spectacle of the Microbats during the Microbat breeding season, and the Night Tigers. The Mareeba Tropical Savanna and Wetland Reserve is a unique community conservation project combining valuable conservation work with environmental education and nature based tourism. The Reserve, known locally as the Mareeba Wetlands, protects over 5000 acres of savannas and wetlands, providing a sanctuary for much of tropical Australia's savanna and wetland flora and fauna, and cultural heritage. The Wetlands, which totals approximately 120 hectares of open water, attracts a rich and diverse birdlife and provide a sanctuary for a wide variety of terrestrial and aquatic wildlife. 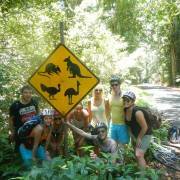 The Visitor Centre lies in the heart of the Savanna and Wetland Reserve, just a few kilometres north of Mareeba.